CELTIC and Rangers will meet on Sunday in the second of this weekend’s Scottish Cup semi final matches. 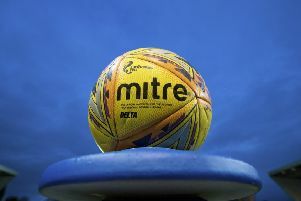 Rangers have already booked their spot in the Scottish Premiership for next season, and have also won the Challenge Cup while Celtic will be hoping to seal a league and cup double. A rare goal from defender Mark Wilson - his third and final strike for the Hoops - gave Celtic a narrow victory in this cup replay, but Wilson’s goal was almost a footnote to an explosive 90 minutes. One of seven Old Firm clashes played over the course of the season, as well as the third in the space of just 26 days, the Gers had two men sent off during the match after Steven Whittaker and Madjid Bougherra were given their marching orders while Rangers midfielder El Hadji Diouf - who had been booked for his part in a scuffle at half time - was red-carded after the match. But the real flashpoint came after the final whistle, when Celtic boss Neil Lennon and Ibrox assistant manager Ally McCoist clashed on the touchline. Dubbed the ‘Shame Game’, this Old Firm match ended with a comprehensive win, and the League title, for Rangers. A brace from Neil McCann and a Jorg Albertz penalty gave Rangers the three points, but the performance was overshadowed by scenes both on and off the pitch. Celtic defender Stephane Mahe was sent off for a second yellow card after 32 minutes, with Rangers a goal up, and the Frenchman left the field of play in tears. Shortly afterwards, Rangers were awarded a free kick near the corner flag, with play held up after a Celtic fan entered the field of play and made a beeline for match referee Hugh Dallas, before being huckled away by stewards. Seconds later, Dallas was hit by a missile from the crowd. Thought to have been a coin, the missile left the whistler with a gash to his forehead, and images of the referee kneeling down while paramedics tended to him on the pitch were beamed around the world. Dallas awarded a penalty kick from the resulting free kick after Tony Vidmar had gone down in the box, with another fan entering the field of play before being marched off the pitch by the police. One supporter appeared to fall from a top tier of the stadium and was stretchered away amid the chaos. With around ten minutes remaining, Rangers striker Rod Wallace was given his marching orders after tangling with Vidar Riseth, with the Norwegian also sent off a minute from time. The ugly scenes continued, as the Rangers players went to salute their fans, resulting in missiles being thrown at the Ibrox players on their way back to the dressing room. Dubbed the ‘Hampden Riot’, a goalless 90 minutes in the 1980 Scottish Cup final led to 30 minutes of extra time, with a George McCluskey goal separating the two sides. But it was events involving the supporters that earned this game its notoriety. Pitch invasions, fighting between rival fans, missiles thrown at opposing supporters and mounted police being called in to deal with the disorder saw both clubs fined £20,000 and a blanket ban on alcohol at all Scottish football grounds. The Scottish Cup final was the only chance for either half of the Old Firm to get their hands on a trophy. Celtic had finished in second place, one point behind league winners Aberdeen while Dundee United had lifted the League Cup. Another game in which football took a backseat. An Andy Walker strike and a Terry Butcher own goal gave Celtic a 2-0 lead after 35 minutes at Ibrox in this league match, but both teams were already down to ten men. Rangers goalkeeper Chris Woods and Celtic attacker Frank McAvennie were sent off after an altercation in the 17th minute, with Gers defensive duo Graham Roberts and Terry Butcher picking up yellow cards for their part in the fracas. Butcher was then sent off for a foul on Celtic goalkeeper Allen McKnight before Ally McCoist pulled a goal back for the Gers. Incredibly, the drama wasn’t over, as Richard Gough netted a last-gasp equaliser and Roberts - who had replaced Woods in goal - was seen to gesture towards the Rangers fans as if ‘conducting’ them as they sang The Sash - although he claimed he hadn’t realised what the fans were singing. Woods, Butcher, McAvennie and Roberts were charged with breach of the peace in the days following the match after the Procurator Fiscal ordered a police inquiry into the game. Butcher and Woods were convicted and hit with fines, while Roberts received a Not Proven verdict and McAvennie was cleared. Played on St Patrick’s Day, four players were sent off and seven booked in this Scottish Cup quarter final match at Parkhead. Goals from Gerry Creaney and Dariusz Wdowczyk gave Celtic the victory, but the hosts had Peter Grant sent off early on before Terry Hurlock, Mark Hateley and Mark Walters were given their marching orders. Souness was actually subjected to so much abuse from Celtic fans surrounding the Parkhead Directors’ Box that Hoops chairman Jack McGinn felt compelled to gesture to the supporters to stop it. Incidentally, it was referee Andrew Waddell’s Old Firm bow. Talk about memorable.